One of the ultimate banes of travel is probably the luggage – or, more specifically, the luggage weight. Frequent flyers may have perfected the art of carrying just enough to skirt below baggage weight limits, but when you’re on a long-haul flight, going on a month-long stay at your family home or are coming back from a busy vacation, the last thing you’d want is to get to the airport and find your baggage is overweight. But never fear – add the right portable luggage scale to your travel essentials, and you’ll never have to stand in line dreading having to fork out some extra baggage fees, or worse, having to leave some of your belongings behind. Take a look at our picks for the best portable scales for your luggage. With a sleek, compact and lightweight design that lets you slip the device into your carry-on or a pocket of your suitcase, this handy little device does no discernible damage to your current baggage weight, but helps you keep it all in check. Boasting endorsements by The Huffington Post and Johnny Jet for the exhaustive list of practical features it offers, this slim device can record weights of up to 110 pounds, covering the usual permitted weight ranges of most airlines, and then some. 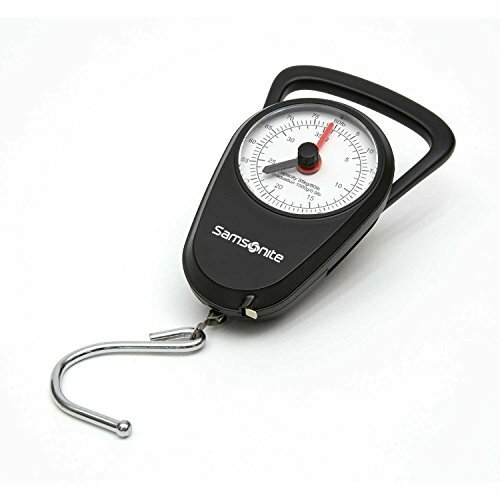 The scale comes with an auto-lock display – instead of having to continually adjust your bags and trying to catch a reading with a heavy suitcase suspended using a handheld scale, the device locks on to the figures once the bag’s weight is stabilized and displays this on the LCD screen. 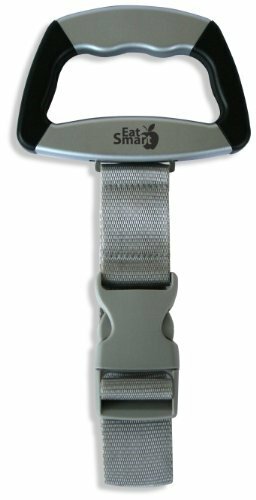 A thick strap holds your luggage in place and offers better stability, while the auto-lock feature lets you set your heavy suitcases back down before getting a look at the displayed weight. Readings are accurate give or take 0.2 pounds, the discrepancy likely to be insignificant when giving you an idea of how much your suitcases weigh before you lug them to the airport. Depending on your preferences or requirements, you can also easily switch from pound to kilogram measurements by toggling through the power button beside the LCD display. A dual purpose portable scale and temperature sensor, this sturdy but compact device comes with a capacity of detecting weights up to 110 pounds, give or take 0.1 pounds. Reinforced with rubber paint technology to make it hardy and durable, the device also comes with a textured grip to make the job of hefting up a heavy bag using this scale and the robust steel hook and strap looped through your bag’s handle that much easier. This device also features the handy auto-lock feature, capturing the appropriate weight once the readings stabilize and letting you set your bags down once the weight has been confirmed. The LCD display also indicates when battery is running low or when the weight exceeds the device’s capacity, and features automatic shut-off systems to switch the device off when it isn’t in use, to judiciously preserve battery life. This device makes up for its non-digital display with a very accurate manual scale instead – which also means no need to worry about batteries running out. Lightweight but robust, the scale has a capacity of measuring up to 80 pounds – falling just within the range of baggage weight limits for standard airlines. The scale has a metal hook to let you snag up the handle of your bag or suitcase, with a comfort grip that lets you easily lift the bag up without straining yourself. The best part of the deal is that once the scale captures the stabilized weight, it will lock the reading, so you don’t have to juggle your luggage around while trying to read a series of ever-changing calibrations. As an added plus, the scale comes with an in-built tape measure always handy to have around to figure out the dimensions of your luggage and what can or cannot be carried on to your flight, as well as for multiple diverse uses around your home. 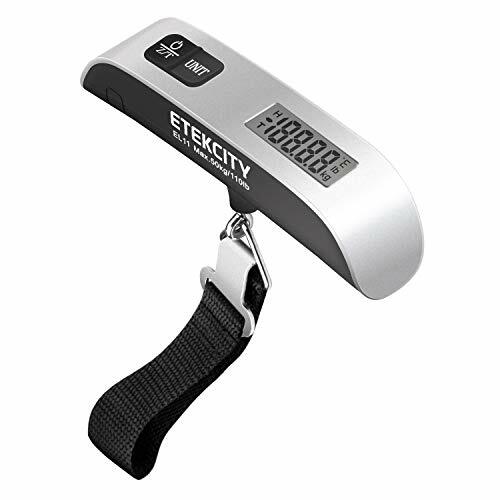 With a double-handed grip that lets you fit both hands through the handle, this scale is ideal for lifting heavier or bulkier pieces of luggage you wouldn’t otherwise be able to pick up singlehandedly. Nonetheless, it is still designed to be perfectly lightweight and space-saving, perfect for tucking into a corner pocket of your bag or suitcase. Measure the weight by simply buckling the strap around your baggage handle and lifting it up using the two-handed grip, listening out for the beep that will signal the stabilized weight of the bag being captured. You can simply tap the power button to return the reading to zero as you proceed to measure other bags, the range of the scale scoring up to 110 pounds, with a graduation of 0.1 pounds. 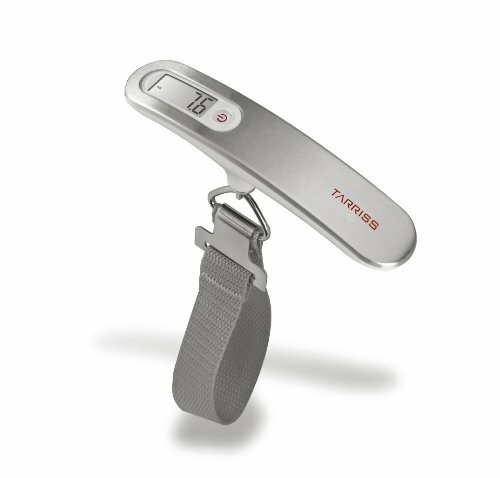 With a digital LCD display backlit to make readings easier to see and a long-lasting, built-in lithium battery, this scale is likely to last you several trips and save you a ton in baggage fees. Portable scales can be finicky if you’re trying to balance your luggage’s weight while attempting to get a steady reading at the same time. However, most great options come with a built-in function that senses when the weight of your suspended bag stabilizes and then locks it. This way, you don’t have to risk swinging your bag around or losing your balance as you try not to jostle the readings – simply put the bag down once the weight locks and check how close you are to your airline’s stipulated weight limit. We also recommend looking for options with sturdy straps and buckles rather than hooks. Hooks have a narrower surface area than a strap, making the latter more efficient in terms of balancing and stabilizing the weight of your baggage before getting a reading. Of course, since we’re looking at portability, picking options which are lightweight and compact is a must. The last thing we want is to take up excessive space or eat into our designated allowed weights with a bulky machine.